In the spring of 1993 a group of 6 friends and I left Seattle, Washington for Las Vegas, Nevada to see the Grateful Dead. We had tickets to all three shows. So we rented a van, drove for 24 hours straight and arrived late night before the first concert. Sting opened up for the Dead and things unfolded as normal as normal can be at a Grateful Dead show. The Saturday was a very different story. Things began with the excitement of any Saturday show and well attended concert. Things changed as we all saw a huge storm cloud coming straight toward the stadium. The next thing we know this very large and ominous cloud parked itself right above the stadium, The Band, and 50,000 fans. As The Dead finished the sixth song of the first set, lightning strikes the stadium. What happened next was truly a miracle. The Grateful Dead show in Las Vegas, Nevada, May 15, 1993. The storm stopped over head and lightning strikes the stadium. Parting of the storm clouds. 50,000 fans experienced something extraordinary. 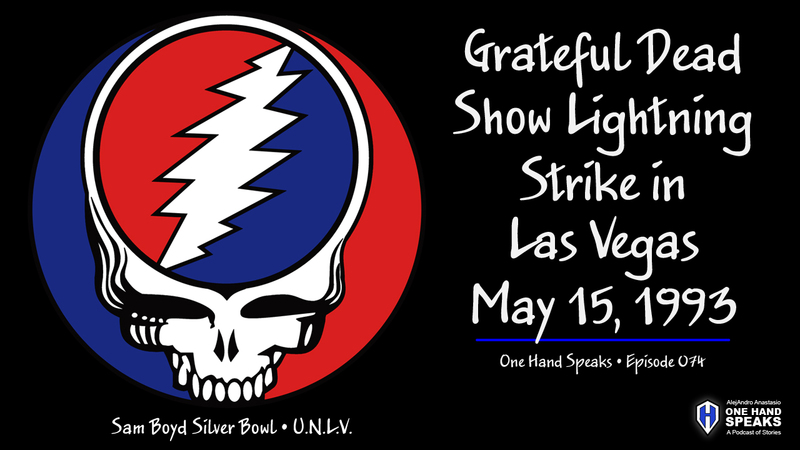 Grateful Dead – Grateful Dead live at Sam Boyd Silver Dome Stadium, U.N.L.V., Las Vegas, Nevada May 15, 1993.